Well take a look at what Ford is going to be releasing next week. A super cool tool that you can use to create your own unique Ford Mustang. Ford has just found a way to let you pit your online automotive creation against examples built by others. The vehicle that you’re tasked with making your own is the Ford Mustang, and the automaker wants you to do battle with other Mustang fans across the Internet. This special Ford Mustang Customizer will go live on Tuesday, September 20th. Once it does, users can pick between all varieties of the Mustang, from V6 up to the big-boy Shelby GT500. Once a user decides on his machine, it’s time to customize it to his or her liking. Ford has a offered-up virtual wheels, body-kits, decals, grilles, decklid spoilers and a few choice parts from the Ford Racing Performance Parts catalog. 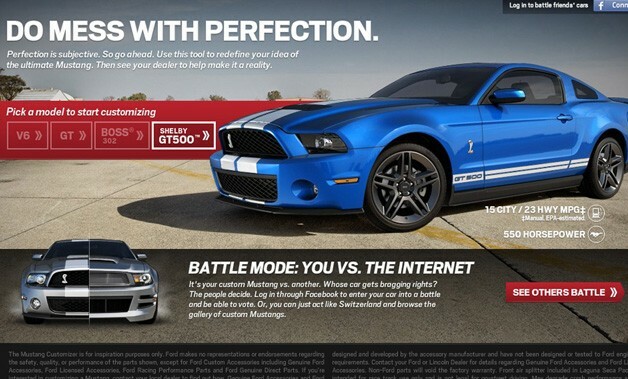 Once your mega Mustang is created, you can upload it to your Facebook page or put it on our Waldorf Ford Facebook page where it can “battle” against examples produced by your friends and other Mustang fans. There will be a leaderboard so you can see how your design stacks up against the rest of the world. Also, if you end up falling in love with your work, Ford will help you turn it into a reality. A PDF description of how you optioned your car can be printed out, and then bring it to us here at Waldorf Ford. All of the Ford performance and styling pieces can be purchased there, while the available aftermarket items will have to be sourced from the applicable vendors. Head over to Ford.com/cars/mustang on Tuesday to get cracking on creating your dream Mustang.